It was time for Thanksgiving with 15 friends. Actually, it was two weeks before Thanksgiving, but this “family of friends” gathers only once a month at our various houses to create potluck dinners built around a particular theme. Nov. 11, of course, happened to be Veterans Day, but it was also as close as the monthly dinner would come to Thanksgiving Day. There was turkey, cranberry sauce, stuffing, various wonderful casseroles (including my dear Charlotte’s amazing broccoli cheese dish) and desserts. Most of all, there was the company of people you know, trust and like. The host and hostess asked everyone to describe what they were particularly thankful for this past year. Of course, there was the unanimous mention of the group of friends itself, the honors and gratitude we owe to veterans, including the six in our group and the good fortune and blessing of having strong family ties. Looking back nearly 400 years, it is hard to imagine what life, fear, and joy there was for the 102 pilgrims who arrived in 1620, especially after realizing that there were many more Native Americans eyeing their activities and intentions. As the pilgrim colony settled in, the unique skills and knowledge of the Native Americans made the critical difference in colonist survival. In the decades and generations that followed, the way these original inhabitants were treated could hardly be described by the use of the word “thanksgiving.” It is interesting to realize that the Pilgrims were “migrants” who landed without proper paperwork as they entered America illegally, by today’s standards. They were greeted, not as people to be incarcerated and shipped back to their place of origin, but primarily as people who needed help and received it. But for that attitude of welcoming, it is hard to imagine how many of the 16 people at our dinner on Nov. 11 would have been there. Certainly, my beautiful wife Charlotte, who had an ancestor on-board the Mayflower, would not have been one of them. Fast forwarding to the present, to categorize all such migrants as dangerous enemies who must be severely and preemptively dealt with represents a clear example of what the HR Doctor has “diagnosed” in past articles and seminars as “hubris” — arrogant pride. Hubris leads nowhere but to deep trouble between people and nations, to violence and a cycle of even more arrogance. The best Thanksgiving gift for America’s future this year and in the years to come would be to substitute our current divisions and reduced tolerance of others with a willingness to listen more than to talk and to deal calmly and respectfully with other people rather than shout at or threaten them. As a nation with roots in migration and a longing for a better life, Americans should not forget our own former “migrant” status. We should recognize that what we are really seeing when we look at a caravan of people hoping their dreams will come true as they try to enter America, legally or otherwise, is a replay of our own family histories. Many of us or our ancestors arrived with identical hopes and faced identical barriers, such as language, religion or intolerance. Recognizing the longing of people for a better life and security does not mean eliminating border controls or accepting the small minority of “spoilers” of evil intent. Overcoming hubris, however, is at least as important to our country’s future as sending thousands of troops to conduct internal security operations at the southern border. “Public enemy number one” is hubris, not immigration. Overcoming it is a matter of recognition of our similarities, more than our differences, and a willingness to learn from new arrivals as well as teach them. I am personally hugely grateful for what America has allowed me to achieve in public service, personal philanthropy and the rise of a wonderful family. One particular Thanksgiving hero to me is my mom who, as a tiny toddler, contracted polio (then called “infantile paralysis”) at age 6 months. As she and my grandparents arrived, nervous and particularly worried at the gates of Ellis Island, grandma and grandpa must have realized what could lie ahead for them as they endured the very long lines before finally arriving at the law enforcement desk. If the immigration officer saw that their chubby-cheeked daughter couldn’t stand up or walk, they would have surely been marked with the dreaded chalk mark. That would have meant she could not enter America. She and, therefore, the family, would not be allowed to enter America because of her polio. My grandfather held her without letting her down for hours so that the early 20th century version of Immigration and Customs Enforcement officers would not notice that she was unable to walk. Fortunately for me, my grandfather’s strength and resolution paid off and they were allowed to pass through the gates into a new life and essentially a new world. To me, that was an act of strength and heroism that led to all that I know and have become, including being the daddy of my own two amazing daughters and a granddaughter. Thanksgiving is a look back in wonder at what happened centuries ago. It should also be a time to look forward to an opportunity to create an even more brilliant future then now exists ­— for our ourselves, our country and our planet. It may be, though that its real meaning lies in taking steps to better understand, respectfully and with an open mind, their aspirations, the challenges they face, and the steps we can take to offer productive partnerships with them. 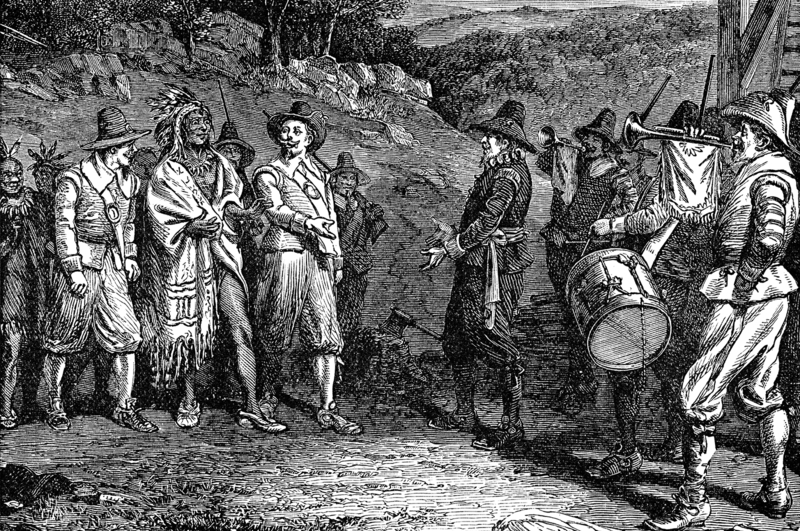 The Native American “greeters” of the Pilgrims four centuries ago offered help for survival. Despite how America repaid that help over subsequent centuries, the Native American attitude toward the Pilgrim migrants still offers us much to think about.